I sat down to write a review for Dark Souls Remastered, but then realised that I would be silly to do so. I've already reviewed this game twice, and yes, the Remastered version on all platforms has enhancements over the original release back on the PlayStation 3, but in all the areas that matter - the narrative, the themes, and the atmosphere - this game hasn't changed in the remaster. The Nintendo Switch version, finally released after delays last week, is much the same deal. So, rather than write a review, let's have a general chat about Dark Souls. Related reading: My review of the Dark Souls Remaster on PlayStation 4. On the Switch, the game is best played in handheld mode. This is partly because if you're going to play it on the big screen TV, you're so much better off playing the PlayStation 4 or Xbox One version, what with its higher resolution visuals and such. On the big screen, the Switch version just can't compare. But in handheld mode? Well, Dark Souls has never actually been portable before (unless you're willing to lug around a gaming laptop, of course). That feature alone makes the game worth a purchase all over again, much as Skyrim, L.A. Noire and various other Switch ports of "blockbuster" games have been. On the Switch's screen, the action of Dark Souls really works; the screen's big enough to show off the game's truly astounding level of detail (to this day I am impressed by the developer's eye for detail), and capture the melancholic gothic atmosphere of the world. What's interesting about the handheld mode with Dark Souls is what it does to one of the game's key features; the online connectivity. What really drove Dark Souls was its ability to build a community around helpful folks, who would pop into your world at your request as a ghostly hero to help you deal with a boss that you're finding particularly challenging, and the dreaded red souls, who would "invade" your world to kill you. If you play Dark Souls on the train, or on a plane, or at a cafe, you're probably not going to be connected, and that makes the game a very lonely single player adventure. 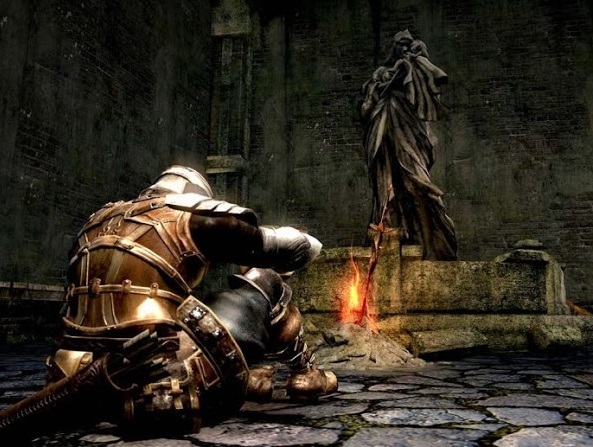 The thing is, I really like this about Dark Souls, and I'm hoping that having to play offline frequently helps some other people to discover that Dark Souls gets really compelling when you're on your own. Structured as a lonely pilgrimage through a world of sadness and tragedy, I have always felt that the game was at its greatest when you felt alone. When the rare "friendly" NPC showed up so you knew you had found a rare moment of safety. When you would stand with some trepidation in front of the white misty doorways, which always marked out some hellish nightmare waiting for you just beyond, and knowing that no one was going to help you out with what was coming. 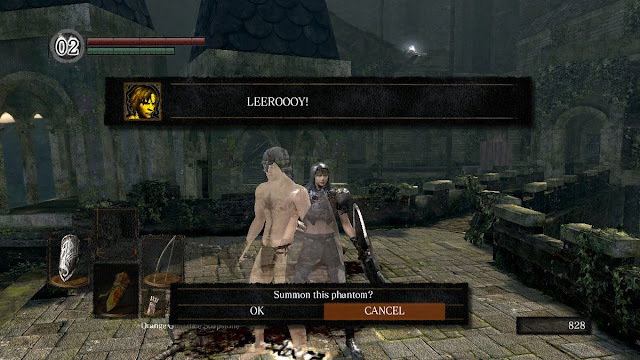 In an odd way, when you play Dark Souls offline, you get the sense that, thanks to the way that it seems to play with distinctly Christian storytelling tradition and themes, that it's an odd blend of homage and subversion of the classic allegorical novel, The Pilgrim's Progress. That story also had the impact that it did because it was a lonely one. It was the story of an individual overcoming all kinds of trials and temptations on his way to salvation with little meaningful help from those around him. It would have been a very different story if the protagonist of The Pilgrim's Progress was part of a tour group. 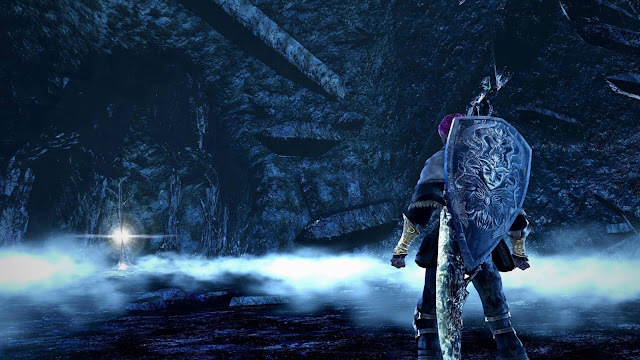 So, while the community elements of Dark Souls are undeniably well executed, help to make the journey a bit easier for players, or give other players a reason to play on beyond the core narrative (the PvP red souls deal), it always seemed to also take a little bit away from the thematic experience to me. It's a kind of visual noise, and it's a gamey element that does more work to break the atmosphere than it does to enhance it. This also goes back to what Dark Souls was before it was Dark Souls. Back, before even Demon's Souls (the unfortunately forgotten precursor to Dark Souls), From Software had a JRPG series called King's Field. King's Field was fundamentally different to the Souls series in a number of critical areas. It played out in first person, for a start, and additionally didn't have the bonfires and "rebirth" after death. If you died in those brutally hard games, it was a save reload for you. But those games, too, were all about a lonely journey through a melancholic dark fantasy, and those games never needed the online features to be worthwhile. I hope this new handheld take on Dark Souls gives people the excuse to play away from the distracting online servers and experience, for me, what is the real core "Souls experience." The Nintendo Switch might not have the HD visuals of the PS4 and Xbox One's take on Dark Souls Remastered, but the portability makes it the superior version, in my mind.